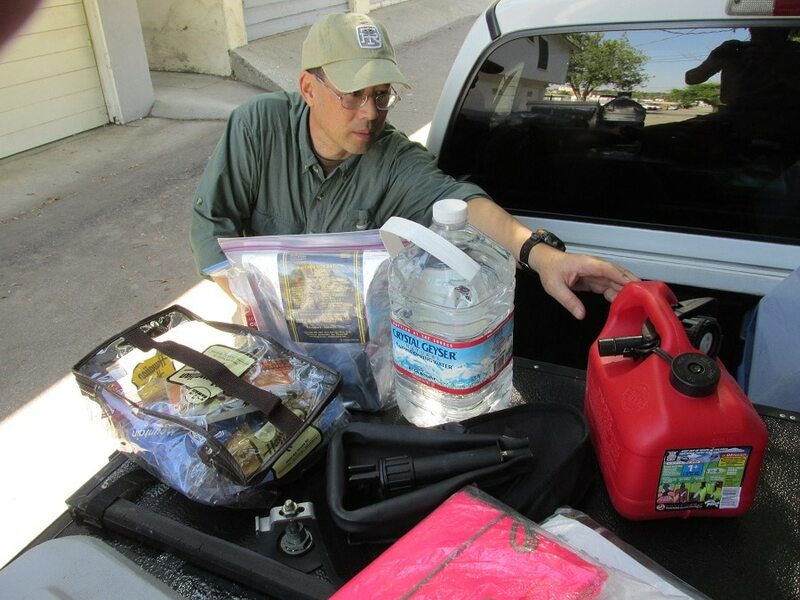 A prepper can’t emphasize enough the importance of a car survival kit. However, whether you are a prepper or not is not relevant in this situation. The truth is that everyone needs to be prepared for the unexpected! A simple ride may turn into a nightmare that can be avoided by carrying a few items that will save you from unpleasant situations. In addition, they can prove to be of real help until a rescue team arrives or until you are able to continue driving again or walk to safety. As it follows, you’ll find out more about the needed equipment for your car, as well as other items that will ensure your survival for a few days. The requirements change depending on weather, so thinking about your safety and survival comes first. Because surviving requires a lot of organizing, it’s best to look at this survival kit in the same way. We will divide it in 3 categories, namely repairs and maintenance, safety and survival, and comfort. There will also be a few extra items for which you’ll only find purpose during winter or just really cold weather. At first you might be overwhelmed by how many things you might need, but being prepared is more important. Since packing an auto survival kit is not something you do every day, focusing on it once will save you a lot of trouble in the future. You might find the overall price of this list unaffordable at once, but you can buy these in time and be prepared for the future. Getting stuck in a remote area could be a chance to use your supplies. However, before getting there, you have to do whatever it takes to fix any problem that occurs to your vehicle. In this regard you won’t have to be savvy if you bring the right items. Reading through instructions and applying them by using the tools you brought is all you may be needed to do. Spare tire. Maybe you haven’t changed a tire in your life, but it’s really important to have one in your trunk. I assure you that you will find a way to use it and get your car going again. Add a jack and a key for the studs too. A flat tire kit and a pump to inflate the wheels. A 12v compressor is also good if you want to replace the pump with something else. 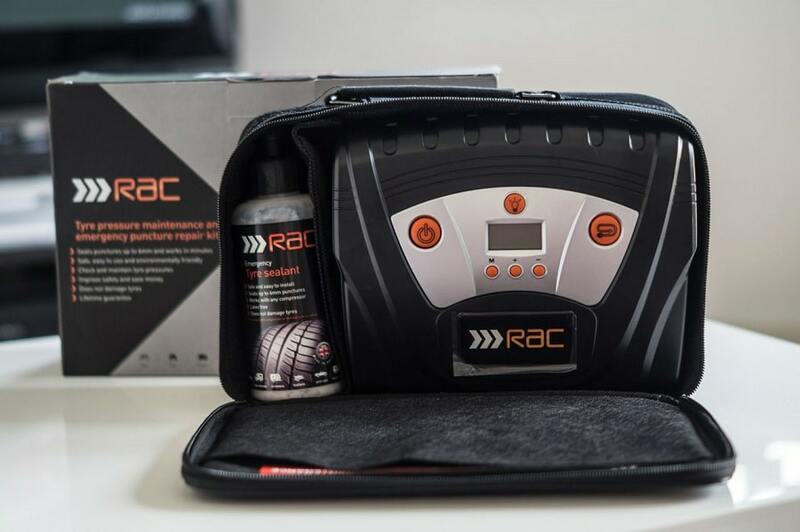 These items will come at hand if something bad happens to the spare tire too. The choice in a good toolkit is yours. To get a better idea of what you should choose, it should contain items like locking pliers, a multifunctional screwdriver, hex keys, wrench that can be adjusted, ratchet and so on. Universal lubricant WD40. Are the studs stuck or you don’t have enough strength? If you use some of this lubricant, you’ll solve the flat tire problem in no time. 6-gauge jumper cables. Regardless of how reliable your vehicle is, especially during wintertime, its battery might stop working. You are helpless without a jumper cable, so don’t overlook this one from your list. Repair manual. Each type of car has a correspondent repair manual that you should keep close to you when taking a long drive. Although it would be ideal for you to know to repair your car, you can at least follow instructions in case you have no idea. An extra can of gas. Extra fuel might make your car heavier, but you’ll thank yourself if or when you get lost and run out of fuel. Gas may be used for other purposes as well, so it is important too. Among its other purposes would be starting a fire or using it to heat the car. Pressure gauge. Maybe this is device is a little too technical. However, measuring the pressure from your automobile’s tires is something you have to regularly do. Low pressure means your fuel will burn faster, so keep an eye on your wheels to avoid fuel loss. Duct tape. This universal item may be very useful in many technical and non-technical situations. There are countless issues that you could temporary solve with the help of duct tape. For example, a broken pipe, a broken window and so on. A pair of gloves. Gloves keep you safe from injury, they keep oily substances away from your skin, which you might not be able to wash afterwards and can be used against cold too. Electric winch. Waiting for a tow truck means being able to call for it or having one available in the area where you are. When that is no longer an option, you might be grateful for investing in an electric winch that should be rated for the weight of your vehicle. 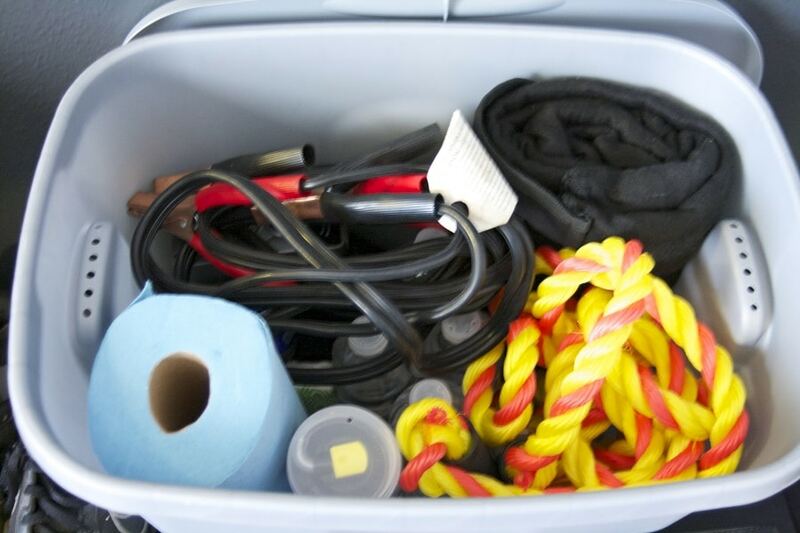 Other useful items in case of catastrophes: antifreeze, brake fluid, more belts, fuses, hoses, oil, replacement bulbs, transmission fluid, windshield washer fluid, rope. Shovel. A folding shovel especially designed for travel is what you need. Snow can get anywhere, so you’ll need a tool to remove it with. This item could be useful in other conditions too, such as muddy terrains. Snow chains. The efficacy of snow chains may prevent you from using that shovel. However, they are a perfect accessory for your tires to wear while driving through snow. Don’t let weather fool you. Be prepared! Sand, salt, kitty litter. Another option to get rid of snow, melt ice and pull your car away from it is to use sand, salt or even kitty litter. They all help when you need to gain traction. Ice scraper. Keeping your windshield clear is essential. According to standard regulations, everyone should have a first aid kit in their car. However, it might not be enough when you venture yourself far away from civilization or something happens on the road and you get stranded. Therefore, besides packing the first aid kit, it would be smart and a fantastic precaution measure to add more items. No one can ever cover all the possible aspects, but the more you take, the safer you are. The items from this category should be packed in a backpack in case you have to leave your vehicle somewhere. You need to be able to carry them. First aid kit items. Make sure the first aid kit your purchase contains the following items. If it doesn’t, you can add some, as well as anything else you might think of, like allergy medicine just in case, or if you know you’re allergic to something. The items are: bandages with and without adhesive, clothe tape, cup for eyewash, pads for heavy bleeding, wipes that are antiseptic, ointment for burns, gloves made of nitrile not of latex because you or someone else might be allergic to it, CPR mask, bandage that is elastic, scissors, tweezers, safety pins, as well aspirin and non-aspirin pain relievers, medication for nausea, high SPF sunscreen. Water. Since you need water to stay hydrated and have enough energy to do what it takes to survive, you should always have some in your automobile. 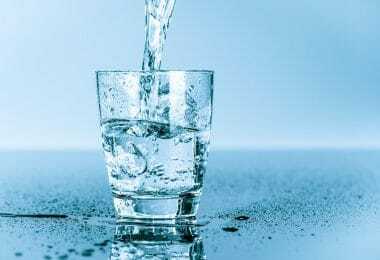 Preppers say that small drink boxes of water are ideal. Take enough for you to stay alive at least 3 days. Also, a refillable water bottle is a good idea to have and maybe some water purification tablets too. These are useful if you find a water source along the way. If not, you’ll have to rely on your supplies. Food. The most recommended sources of food are energy bars and protein bars. They have to be low on sugar and low on salt because the last thing you want is for them to make you thirsty. Purchase these from camping stores because the ones from the convenient stores are not that good as the other ones especially conceived for emergency situations. You can also pack nuts, dry fruit and seeds. Flashlight. A flashlight must be part of your vehicle survival kit. You’ll need it to see what’s around you, when searching for an item or even when trying to fix your engine maybe. There are some cool flashlights with special buttons for the Morse code and others. Bring more batteries that you think you might need. Penknife. This one shouldn’t be packed somewhere in the trunk because you might need it to cut things like your safety belt in case of an accident. It has multiple other uses, so make sure it’s a good one. Ideally, it also cuts wood. You never know what other survival technique you’ll have to apply. Matches or a lighter. Making a fire is a possibility for which you should be prepared. Make sure the matches you buy are usable during windy conditions and that water doesn’t affect them. Having a lighter with you won’t occupy space either. In case you’re a smoker, bring more lighters. For more tips on how to choose the best waterproof matches, see our article on this topic. Waterproof poncho with a hood. Getting wet is something you want to avoid whether you’re outside your car to fix it or you are forced to save yourself by going on foot. Standard floor-mounted fire extinguisher. To be extra safe and have a solution against emergencies when things spark up in your car, take a standard floor-mounted fire extinguisher with you as well. Hazard triangle and road flares. These items are useful during the night. The latter may be used against wild animals as well. Solar and/or hand crank powered light/radio/cellphone charger. It goes without saying how useful such device can be. Being able to call for help, if help is available, is a stress reliever. Compass. Don’t rely on the GPS from your phone. Using your car’s battery to recharge your phone could be a waste on the long run. If you want to learn how to use a compass, try reading our must-read article on this important navigation tool. Map. A map can prove to be a real life saver together with the compass. Keep it in a plastic bag and make sure you don’t lose it. Backpack. This list comprises a lot of items that one person will not be able to carry. Some of them should be left in the car, but most of them should be taken with you. When deciding to go on foot, pack important things that may give you shelter, keep you hydrated, fed and include the first aid kit too. Pepper spray. The possibility of running into a bear or another threat is real. Stay prepared by putting pepper spray in one of the handy pockets of your backpack. To find out how to choose the top pepper sprays , see our comprehensive reviews to find out more. Wool blanket and emergency blanket. The wool blanket is just a regular blanket, while the emergency blanket is that metal-coated plastic sheet. Both are designed to keep you warm. Not having any of these might determine you to consume your car’s fuel, fact which isn’t recommended. If you find yourself unprepared in such situation, start the engine for 5 minutes every half an hour or so. Extra clothes and warm hat. Most of your body’s heat is eliminated through your head. Keeping it covered will ensure comfort and a constant body temperature even in extreme situations. Heat packs. These function based on a chemical reaction. You don’t need batteries or electricity for them. Each contains a chemical and water. In order to activate them, all you need to do is combine them. Cold packs exist too! Check them out if you live in a hot area or by the desert. Snow shoes. 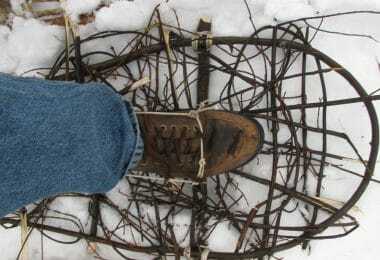 You have to give a lot of thought whether you need snow shoes or not. 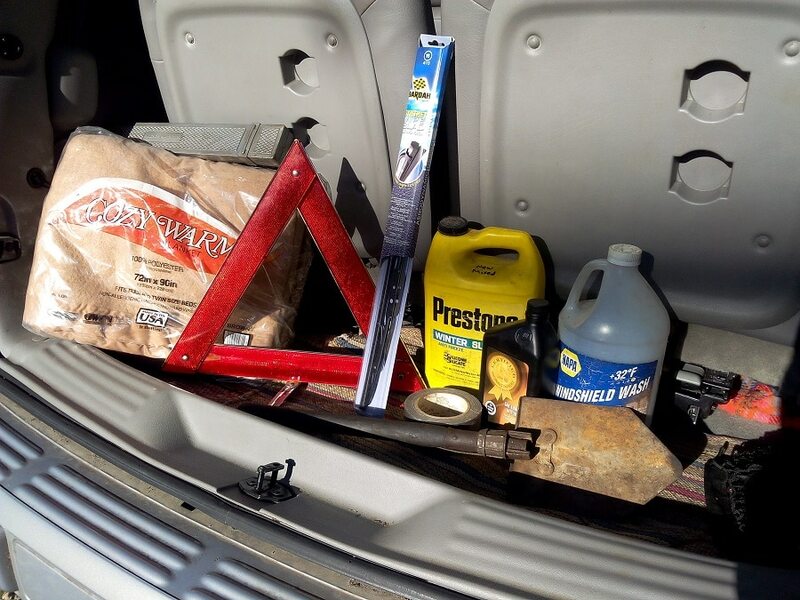 When putting together a professional survival kit for your car, you must think of items that will get you out of trouble. If the probability of needing show shoes is high, then pack them! Size-wise snow shoes are large and might not comfortably fit in your vehicle. Living in your car for a few days could use some comfort. Besides the items that you really need to survive, you can pack a few other things that will keep yourself and your vehicle clean. 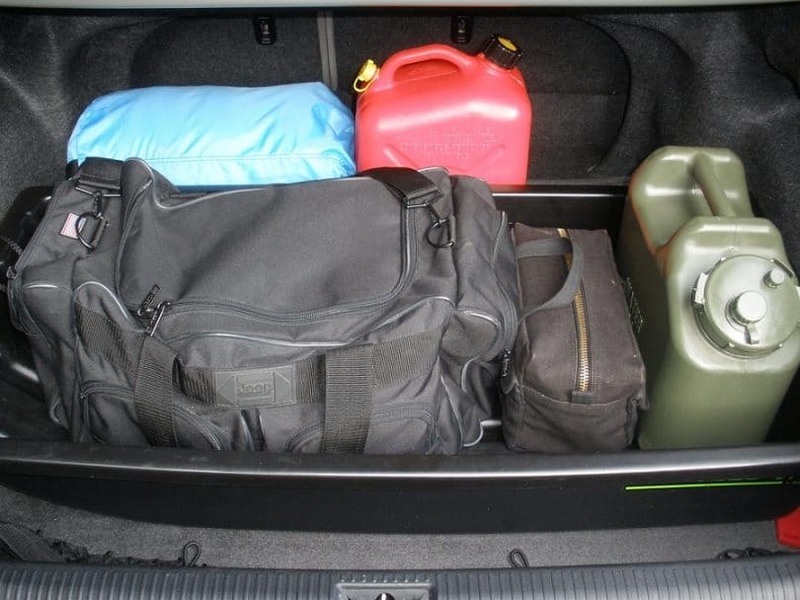 Disposal containers don’t occupy space and they don’t weight anything close to considerable, so having a few types in your auto survival kit could be a breeze. Moreover, if you travel with your kids, they will need some entertainment. Having this aspect covered as well can make your survival easier. Toilet paper. Drinking water and eating aren’t the only natural needs of your body. Therefore, toilet paper is something you will definitely have to use. Unscented baby wipes. Since you can’t spare water to wash yourself, having baby wipes in your car will solve a lot of problems. Trash bags. Or large zip-lock-style bags; these are things needed for you to improvise a potty. Let’s say you are stuck in the car or the temperature outside is simply too low to get out. You will gladly use a trash bag if you are alone. However, you might as well get over the shame and do the same even if others are with you. Feminine protection. Like getting stranded wouldn’t be awful enough, women might go through that time of the month. Don’t leave this aspect out and waste other supplies to take care of this inconvenient. Deck of cards. Or anything else that can keep you and others sane. The amount of stress you can go through in a life-threatening situation will not go away unless you do something about it. If you are alone, you can rely on reading a book. Bonus item: Cash! Best case scenario, you aren’t really in the wilderness and the world didn’t end. However, you can’t use your card to pay for something that you absolutely need. Hide some cash inside your car for situations when you got out of hell and don’t want to die because you don’t have money for a bottle of water. Buying and organizing all the items mentioned so far will not be easy or cheap. However, if you want to be safe, then you have to gather all the supplies that you need. There are so many situations you have to be prepared for that these lists may seem endless. Even so, you can personalize them and take what you think it’s absolutely necessary. Maybe you don’t need one item for each action and you are already used to being creative. Multi-purposing is key in surviving, so keep it up! Do your homework and don’t invest in devices and gadgets that promise you an effortless escape. Also, try not to purchase the most expensive items you find on the market. 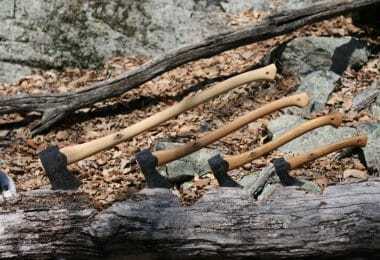 Think like a survivalist who can make his or her own tools. Improvising is an important part of surviving. So, as long as you have the most important things at hand, you can use them according to the situation you’re in. 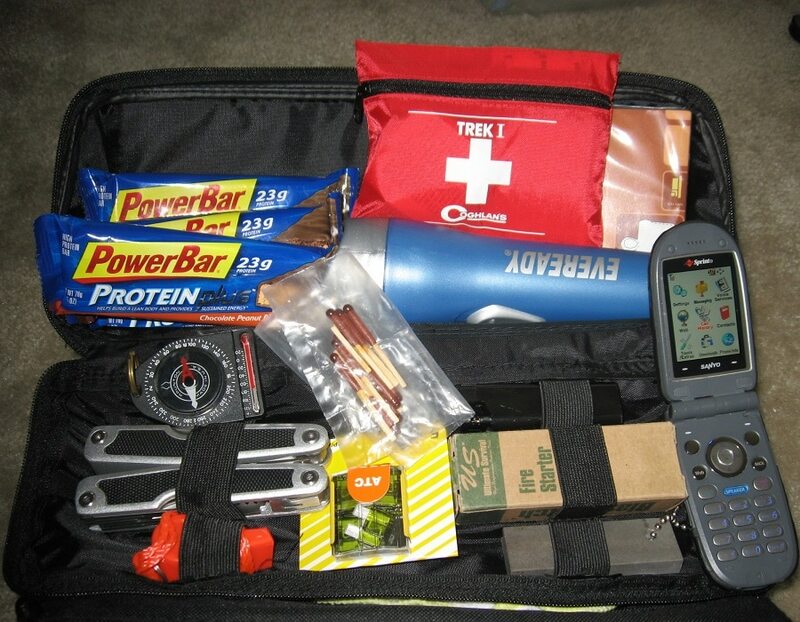 Check out our useful tips on how to build the best bug out bag to help you with your survival needs.